He was spotted today along Maryland, Lagos, doing what he knows best. Thirty-year-old Abdulahi Olatoyan, is popular as the “dapper windscreen cleaner” because of his officious style of dressing while cleaning windscreens for motorists in the traffic. He came into limelight after being discovered on the streets of Abeokuta. 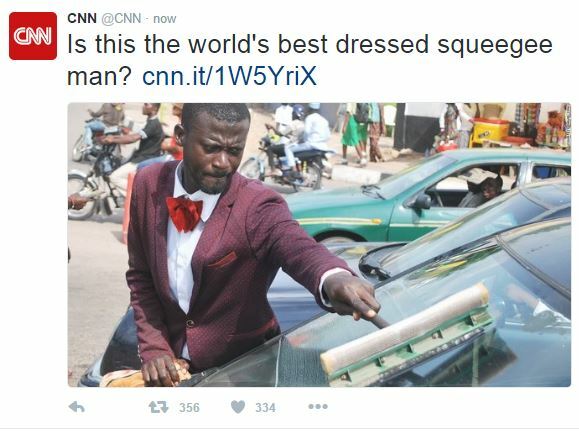 After being discovered, he became so popular that media giants CNN featured him on the network, Is this the world’s most dapper squeegee man? Uche Nnaji Founder & Creative Director of OUCH Fashion, tried to mentor him but they later fell out. OUCH! told me a job was awaiting me when my picture surfaced on the Internet. But the photographer didn’t want me to meet OUCH! He wanted to take advantage of me to make money. OUCH! told me the photographer wanted to manage me and he said I will have to learn tailoring and during that period he was not giving me transportation fare and I was borrowing money for transport. I was like I’m not a company, why a manager? I came to get a job to help myself and family and also plan for my education which is of huge importance to me. I had to abandon him because I felt he was using me to advertise his brand and people outside thought he was doing much for me. Someone even called to say he heard Uche Nnaji took me to America. He did not give me any suit as reported; he gave me three shirts and one trouser. And what was it he was teaching me that I did not grasp. This is not to say I do not appreciate what he did for me but people are exaggerating, thinking he was doing much for me. I was the one that went to National Open University (NOUN) myself to make enquiries concerning continuing of my education. When I told OUCH! about my findings, he did not show any interest in what I told him concerning my education. Now, he is back on the streets washing windscreens in traffic. Will another mentor take interest in him? 6 Year Old Comedienne, Emmanuella Gets Featured On CNN… Our Girl Going Places!! !